The sixth chakra in Kundalini yoga, the Anja, is located in the centre of the forehead. Also known as the third eye it is a focal point for inner reflection and symbolises a connection to the higher mental powers. With recent (>100 years) discoveries in Western science fingers point to the pineal gland as being the physical representation of the third eye. 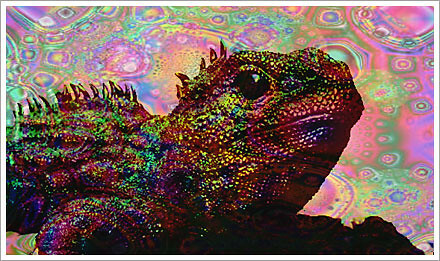 The possibility that the pineal gland could be a vestigal third physical eye is backed up with research into New Zealand’s native lizard, the Tuatara. This short informative article highlights research into the pineal gland and the relationship between neurotransmitters like serotonin and melatonin, the third eye and psychactive substances like LSD-25.